By capitalizing on employee networks, companies can start addressing the need for increased hiring in today’s new era of talent acquisition. The following report presents employer and job seeker attitudes towards employee referrals and their impact at an organization. 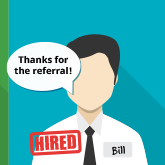 Employee referrals are the most significant source-of-hire for employers, bringing in top talent that increases quality-of-hire, instances of cultural fit, positive results, and decreases key metrics such as cost-per-hire, time-to-fill, and turnover. Additionally, referred employees have higher job satisfaction, report better culture-fit, and feel more prepared to execute on their job duties.